CHURCH OF ALL SAINTS, ALMONDBURY, WEST YORKSHIRE. RESTORATION. 1872-1876. 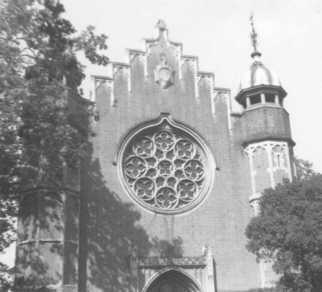 Crossland had first prepared plans for a restoration of this church in about 1864 but the matter had not been proceeded with. All those difficulties, which had tended to delay the "Restoration," having been nearly overcome, and the state of trade being flourishing, it was now felt that the time was arrived for making an effort to restore the mother church to its primitive simplicity and render it more healthy and commodious for the purposes of Divine worship. That at present the floor was damp owing to the height of the surrounding ground above its level; and the mutual sight of the minister and people impeded by the galleries and the position of the pulpit. He had been informed that, about seven years ago, plans and estimates were obtained from the eminent architect, Mr W H Crossland, and by request of the churchwardens and sidesmen, he had written to that gentleman, but had not yet received an answer. Crossland inspected the church in Autumn 1871 and prepared plans for the rebuilding of the Chancel, and extension and elevation of the side chapels. The work commenced in Spring 1872 and was completed in November 1876. A note in the memorandum book of the local agent of Sir John William Ramsden indicates that all did not run smoothly, "26 June 1865. Informed Sir John Ramsden of my interviews with Mr Crossland and of the combined blundering of Canon Hulbert and Mr Crossland respecting the joiner's estimate." No further evidence has been seen of the nature of this blundering. The Ramsden family, as absentee landlords of an estate which, particularly in the nineteenth century, yielded a princely income, employed very able individuals as agents. R H Graham was the local agent at that time; it is difficult without any further facts on the matter to judge whether there truly was a blundering or whether Graham was puffing up some minor matter to draw attention to his own usefulness. These local estate officials, from acting in loco of their employer, tended to have a very good opinion of themselves and their own abilities. The conceit of the estate cashier, Isaac Hordern, is noted elsewhere. 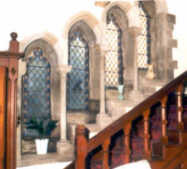 Sir John Ramsden was interested in the restoration as Patron of the living and it is thought that he made himself responsible for the cost of the renovations so far as they related to the chancel. Plans of the renovation by Crossland as well as some elevations which could well be from his hand are preserved in the faculty papers of the Diocese of Ripon. Similar papers relating specifically to the chancel are to be found among the Ramsden Estate papers. The stained glass was by Heaton, Butler and Payne. CONCERT HALL, HUDDERSFIELD, WEST YORKSHIRE. UNEXECUTED. 1873. In June 1873 a prospectus was issued for building a Concert Hall in Huddersfield. It was intended to cost £7,000 and was to be financed by the issue of 2,000 shares of £5 each. The leaflet noted that application had been made for a plot of land in Queen Street South and that W H Crossland had prepared plans of a hall to seat 1,700 people and an orchestra of 300. The plans, however, being thought too elaborate and costly were being modified. Nothing further is known of this project. The reason why it was aborted is not known, it may have been that the Borough Council even then had thoughts of incorporating a Music Hall in the civic buildings, which it finally did in 1881. LAUNDRY AND KITCHENS, GEORGE HOTEL, HUDDERSFIELD, WEST YORKSHIRE. 1873-1874. 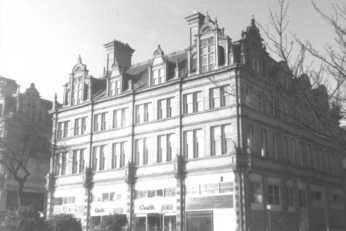 The George Hotel was Huddersfields premier hotel and had always, as a matter of policy, been owned by the Ramsden family. Following a period of mismanagement the Hotel was let in 1872 to a company formed by a group of local businessmen. The new laundry and kitchens which were to be situate in an enclosed yard behind the hotel were no doubt part of the efforts to restore the standards of the establishment. Tenders for the works had been received by December 1873 and they and the plans were approved by Sir John Ramsden in February 1874, and were passed by the local authority in the following month. It would appear that the Estate's experience with Crossland had given rise to certain misgivings on his cost control. In 1877 Graham noted that he had to submit a statement of extra costs beyond Crossland's guaranteed estimate of £1,332. The total costs had mounted to £1,889, including Crossland's commission of £85 and expenses of ten guineas. Mason Abraham Graham & Sons, Huddersfield. Slaterer W Goodwin & Sons, Huddersfield. Plasterer D Tunnacliffe & Sons, Huddersfield. Painters Knight & Jackson, Huddersfield. Fire Proof Flooring Robert Dennett & Co., London. POST OFFICE, HUDDERSFIELD, WEST YORKSHIRE. 1873-1874. When there was agitation in Huddersfield for the erection of a new and enlarged Post Office the Ramsden estate continued their newly established practice of building to rent. There was some initial difficulty because the postal authorities insisted on a one-storey building lighted from the roof. At the rental offered this would not have given the return per square yard which the estate required. To overcome this financial obstacle it was agreed that a higher building could be erected close behind. In the event the single-storey section of the block was relatively small, being dwarfed by massive blocks of warehousing at either end. The site is a sloping one and the upper block is three storeys high, the lower four storeys. The bargain with the Post Office was agreed in December 1873 and the plans were approved by the local authority the following month. VICARAGE, NEWSOME, NEAR HUDDERSFIELD, WEST YORKSHIRE. 1874-1875. The vicarage for Crossland's church of St John The Evangelist. The plans were approved by Huddersfield Borough Council in April 1874, the first stone laid in June and the house was occupied by July 1875. A set of Crossland's plans and elevations for the vicarage are among the church records. ST ANDREW'S PARSONAGE, HUDDERSFIELD, WEST YORKSHIRE. UNEXECUTED. 1875. At the time of building St Andrew's Church, it was estimated that the addition of a parsonage would cost £1,600. Probably lack of funds caused the matter to be shelved. In March 1875 plans prepared by Crossland were submitted to the Diocesan architect, G E Street, R.A., who considered the ground plan "not quite satisfactory. The door of the sitting room opening too close to the front doorway and the W.C. being conspicuously placed in the hall. In other respects the plans are very good." He reported also that the specification was satisfactory. 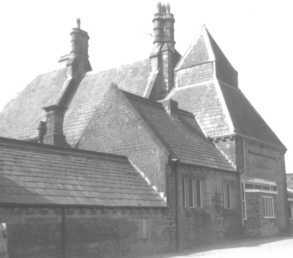 Nothing is then heard of the matter until March 1877 when a grant of £500 was offered towards the building. St Andrew's stood in a relatively poor area, an area where industry had prospered and which the wealthy industrialists had deserted for more fashionable suburbs. As a result there were substantial houses to let in the area, no doubt at very reasonable rents. It may well have been this factor which led to the demise of the Parsonage scheme. A magnificent Victorian arcade which has recently been extensively refurbished, the arcade was planned in 1878 and received the approval of both the Borough Council and Sir John Ramsden in December of that year. It would seem that at that time Sir John was losing patience with Crossland over the increasing costs of various works which he was undertaking. We have already seen that there was an enquiry into additional cost incurred at the George Hotel; there had been extras on Byram Buildings, and costs had escalated at Longley Hall, and whilst much of that would be attributed to Sir John's own revisions, the impression of greatly increased costs would remain. It may be that Crossland's experience at the Virginia Water Asylum, where money was of no object if well spent, had led him to be too generous in these Huddersfield projects, most of which had to be controlled on principles of commercial viability. 7.3.1878. Westgate & Kirkgate Improvements. On my representations and recommendations Sir John consents to allow Mr Crossland to proceed with the preparation of the plans in these undertakings -by this giving him another trial. He pledging himself by the strongest assurances that there shall be no extras whatever beyond the contracts unless specifically ordered or authorised by me on behalf of Sir John. The new arcade fronted on to Westgate, the Kirkgate development was Kirkgate Buildings which will be considered. It will be a matter for consideration whether Sir J W Ramsden would not prefer to have one important block made of the Byram Buildings and the Byram Arcade, rather than cut up the elevation into three styles for the one block. There is no doubt it would be a more dignified treatment to adopt the former plan and thus treat the Arcade buildings in the same style as the Byram Buildings. It does not appear whether this opinion was actually a received one from either Sir John or his agent, but it was acted upon, and the result is that the principal front of the building presents a pleasing unbroken facade with no external evidence of the two distinct stages of construction. 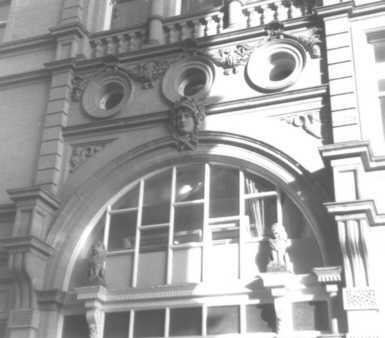 Byram Arcade tenders totalled £18,000, with the final cost, including payments to the architect and the clerk of works, nearly £20,000: Crossland's commission and travelling expenses were included in estimates at £860. KIRKGATE BUILDINGS, HUDDERSFIELD, WEST YORKSHIRE. 1878-1885. This was a substantial and prestigious development, remodelling an area of squalid eighteenth-century yards above the Parish Church. The whole area was razed and three blocks of shops, offices and warehouses built on the site. The three blocks were designated the west, main and north blocks. The main block, the largest of the three is bounded by Kirkgate, Wood Street, Church Street and Byram Street, to the north of this lies the north block, and to the west, fronting onto Kirkgate, the west block. The west and main block cost some £32,000 and the north over £12,000. The Borough Council passed the plans for the main block in September 1879 and Sir John Ramsden approved the finished plans in November. Crossland experienced more meddling from Hordern, the estate cashier, on this commission. We have a copy of Crossland's remarkably restrained reply to one lot of suggestions. You appear to forget that the staircase being double have apparently a greater width than a single one has. I think four feet enough. The west block was finished by July 1882 when all that remained to be done was some of the carving. 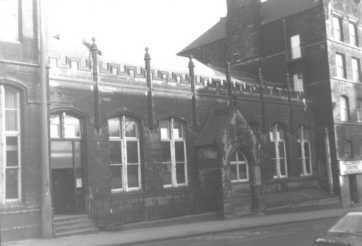 At that date the main block was approaching completion and by December Graham was able to write "The Kirkgate main block is so far finished that any part can be made fit for occupation immediately it might be wanted." The plans and tenders for the north block were submitted in April 1881, and it must have been virtually complete by 1885 when further outlay was estimated at £450. The three blocks incorporate some splendid carving which Crossland commissioned from Fucigna. The following shows the prices and identifies the subjects. Huddersfield 24.7.1882. Mr Fucignas' charges for models and castings, Kirkgate Buildings. ROYAL HOLLOWAY COLLEGE, EGHAM, SURREY. 1879-1887. CHAPEL, HOLLOWAY SANATORIUM, VIRGINIA WATER, SURREY. 1881-1885. It had originally been intended that the religious needs of the Sanatorium would be met by the use of the great hall. In 1881 Holloway had a change of heart on the matter and Crossland was commissioned to draw up plans for a separate chapel on the site. The projected cost of the chapel, which was built by John Thompson of Peterborough, was £12,500. Crossland received £50 for furnishing the plans and 5% commission, a total of £675, the final payment to him being in July 1885. TOWN HALL SPIRE, ROCHDALE, LANCASHIRE. RESTORATION. 1883. In 1882 it was discovered that the wooden spire had been attacked by dry rot. A deputation from the Council waited on Crossland at Mount Lee, the site of Holloway College, and on 3rd March 1883 he promised to supervise the restoration work, charging only out-of-pocket expenses for the same. He prepared a specification and estimate, but on 10th April 1883 before anything had been done the spire was destroyed by fire. It is probable that Crossland was then too busy to design the new tower, the commission for which was placed with Alfred Waterhouse of Manchester. CHURCH OF ST MICHAEL AID ALL ANGELS, SUNNINGHILL, BERKSHIRE. RESTORATION. 1888. Crossland's last known work, the restoration was undertaken as a memorial to Thomas Holloway, who had lived in the parish, at the cost of his relatives. The main work was the addition of a large chancel, a chapel and an organ chamber. RISHWORTH LODGE, RISHWORTH, WEST YORKSHIRE. DATE UNKNOWN. Crossland designed Rishworth Lodge, a shooting lodge on the Lancashire/Yorkshire border for Henry Savile: the year of the commission is not known.